“42nd Street” – Courtesy of Beef & Boards Dinner Theatre. Used with permission. There is just something about tap dancing that has always captivated me. I suppose it has to do with the sound of tap shoes striking the floor in a form of percussion and its association with Broadway. 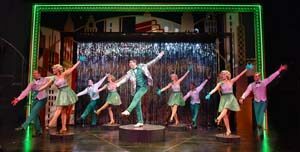 In fact, the type of dancing featured in “42nd Street” is called “Broadway tap.” On Saturday night, I got my fix when I saw the musical, based on the 1933 film of the same title, at Beef & Boards Dinner Theatre. The show runs through May 19. A Tony Award-winner for Best Musical, “42nd Street” premiered on Broadway in 1980. The show’s book is by Michael Stewart and Mark Bramble, with lyrics by Al Dubin, Johnny Mercer and music by Harry Warren. The original production was produced by the legendary David Merrick and the equally renowned Gower Champion. 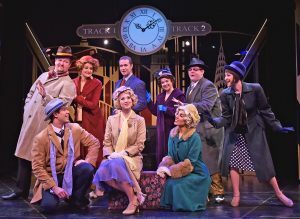 Based on the novel by Bradford Ropes, “42nd Street” tells the story of famed, tyrannical Broadway director Julian Marsh, whose goal is to present the best musical of all time when the Great Depression is at its peak. The Beef & Boards production, though smaller in scope, does wonderful justice to the original, thanks to the creative efforts of director Eddie Curry, choreographer Ron Morgan and music director Kristy Templet, who all knocked it out of the park with the show’s staging, dancing and singing. Of course, the show’s success is also due to an accomplished cast, with each member turning in strong comedic and vocal performances. They include Mark Epperson as the no-nonsense, demanding Julian Marsh, Sarah Hund as temperamental star Dorothy Brock, Kaylee Verble as starry-eyed ingénue Peggy Sawyer and Dan Bob Higgins as perpetually sunny Billy Lawlor. Also making vivid impressions were David Buergler as Mac and Lanene Charters as Maggie. Ah, but it was the chorus that ultimately stole the show. 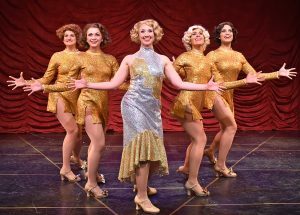 This talented, synchronized, disciplined, magnetic ensemble of hoofers brought the house down in production numbers, which included “We’re in the Money,” “Lullaby of Broadway,” and “42nd Street,” as they executed Morgan’s sparkling choreography. As mentioned previously, this production, due to Beef & Boards space limitations, certainly does not come close to matching the scale of productions I have seen in larger venues, but director Curry and colleague Morgan thoroughly succeeded at capturing the attitude, style and very essence of the original. It’s not hard to imagine the impact the musical’s 1933 film had on Depression-era audiences, who went to movies in droves in order to escape their troubles. Plus, the idea of an obscure, young talent coming out of nowhere to become an overnight sensation is still a compelling fantasy in the narrative of the American Dream, to which even the most jaded still connect. This Beef & Boards show elicits all those responses and more, packing a wallop when it comes to unbridled entertainment. For a dose of satisfying unreality, it’s well worth experiencing. For tickets call the Beef & Boards box office at (317) 872-9644 or visit beefandboards.com. Tickets range from $45 to $70 and include Chef Odell Ward’s dinner buffet, fruit & salad bar and unlimited coffee, tea and lemonade.